Eggplant is one of my favorite vegetables and I love to try eggplant recipes from different parts of the world. This vegetable is known with different names at different parts of the world and it is cooked in so many different ways in every continent. It is known as Brinjal in South Asia and South Africa, Aubergine in UK. My mother-in-law is visiting us from India. So it is time for lot of Indian food. 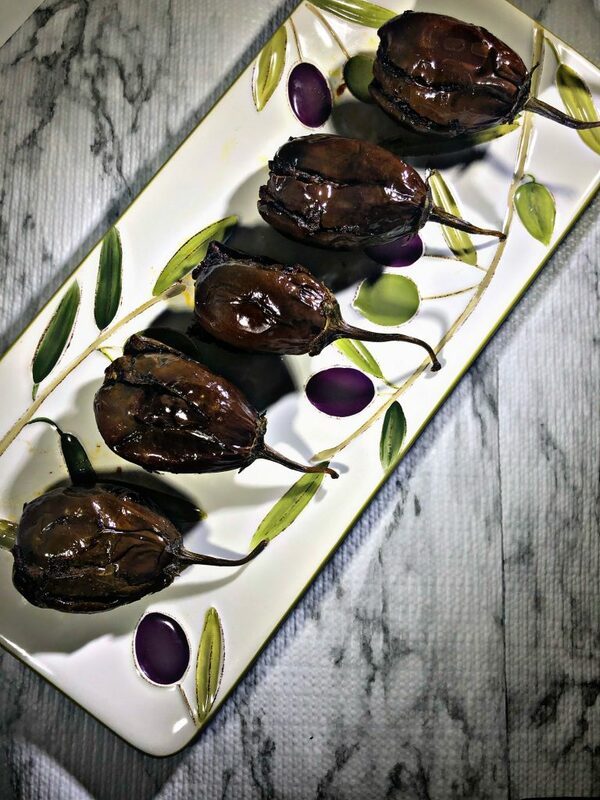 Here is a spicy, aromatic baby eggplant air fryer recipe. 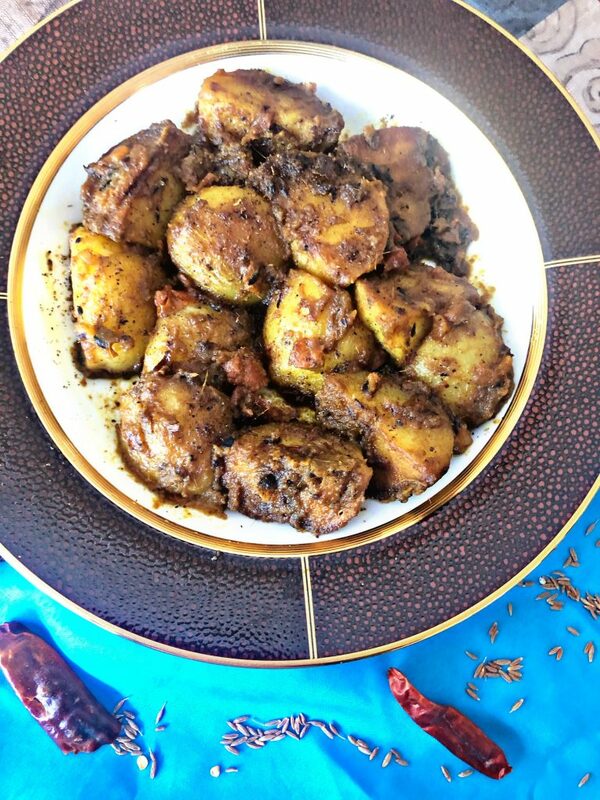 This delicious eggplant cooked in air fryer is perfect for eating with roti or nun. Air fryer recipe for delicious baby eggplant cooked with Indian spices. This is a quick dinner recipe that can be enjoyed with roti or nun. Set the Air Fryer at 275 degree F and 12 to 15 min setting. The timing is an approximation as the time may vary based on the type of the egg plant. Start checking the egg plant after cooking it for 10 minutes in the air fryer. It is that time of the year where you have to arrange multiple holiday parties and have to go to many potlucks. So it is time to look for easy but tasty recipes. 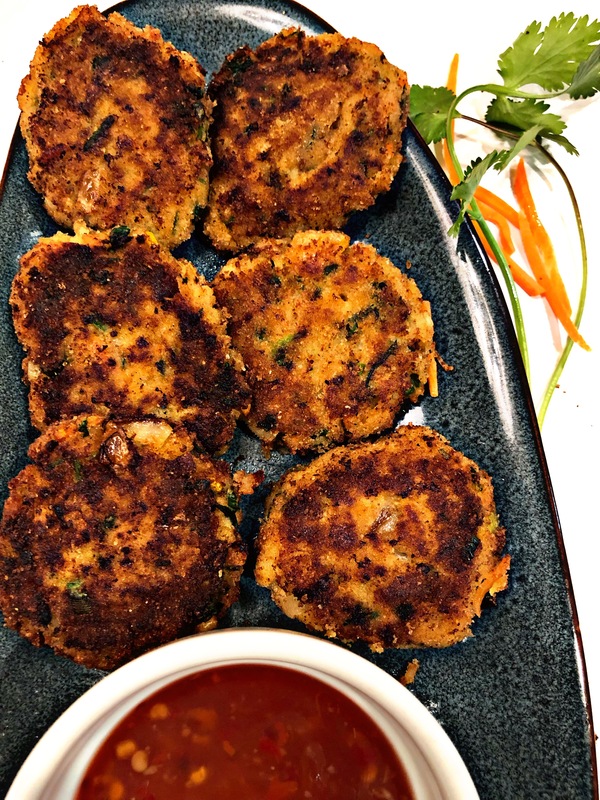 This year I made this shrimp cake for a potluck with close friends and it was a hit. So here is the recipe. Take a big bowl where all the ingredients can be mixed together. Add the shrimp meat. Mash the shrimp meat with hand or using a food processor. Add ginger, garlic, carrot, scallion, cilantro, lemon juice, lemon zest. Let the mixture sit in the fridge for at least one hour. Now make flat cakes with hand and bread both the sides with the bread crump. Are you wondering about an easy to make vegetarian appetizer for holiday party? 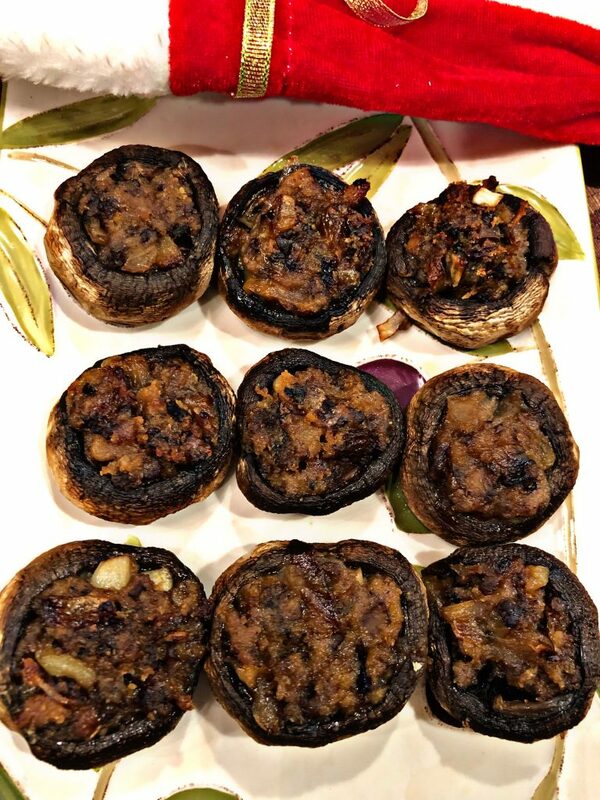 I got this stuffed mushroom recipe from one of my Italian friends many years back and added my own improvisations on top of it. For office potluck or any potluck with friends I rely on this recipe. 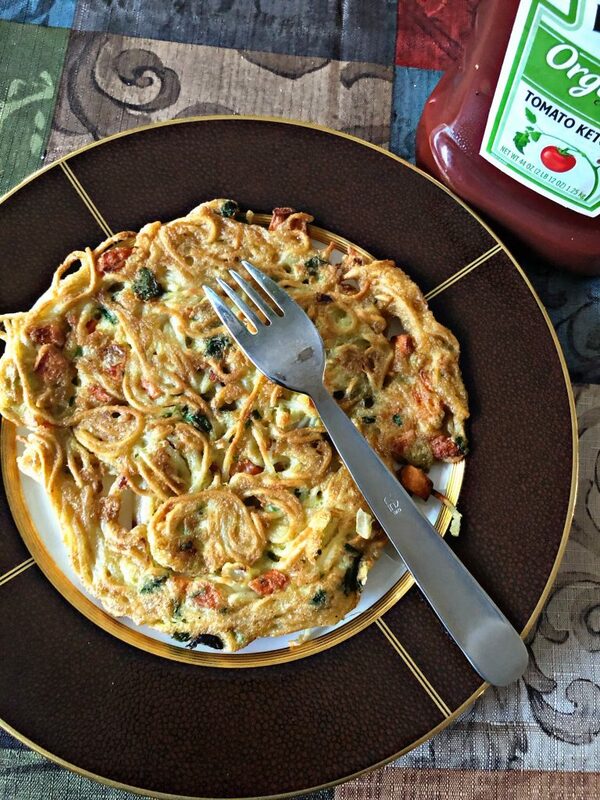 It is quick, tasty and likable to palates for diverse races. In a skillet, add little bit of oil. When the oil heats up, add the chopped garlic. As the garlic turns slightly brown, add the onion. As the onion turns slightly brown, add the chopped stems of the mushrooms and fry it until cooked. Add the cheese. Cook for 1 min. Now add little bit of stuffing in each of the mushroom and fill it up. Heat the oven to 350 degree F. Grease a baking pan and line up the stuffed mushroom in the baking pan. Bake the mushroom for 18 min. At the end, broil the mushroom for 1 min. In a gloomy, rainy day when it is raining cats and dogs, what can be more comforting than a bowl of hot soup? This is Thanksgiving week. My employer is very generous to give the whole week off. Despite the fact that I am spending a lot of time in the couch this week, I got really motivated to make the sweet corn soup and to serve it for lunch. My kitchen has many of the modern gadgets, including an Instant Pot. I like to cook the soup in the Instant Pot. 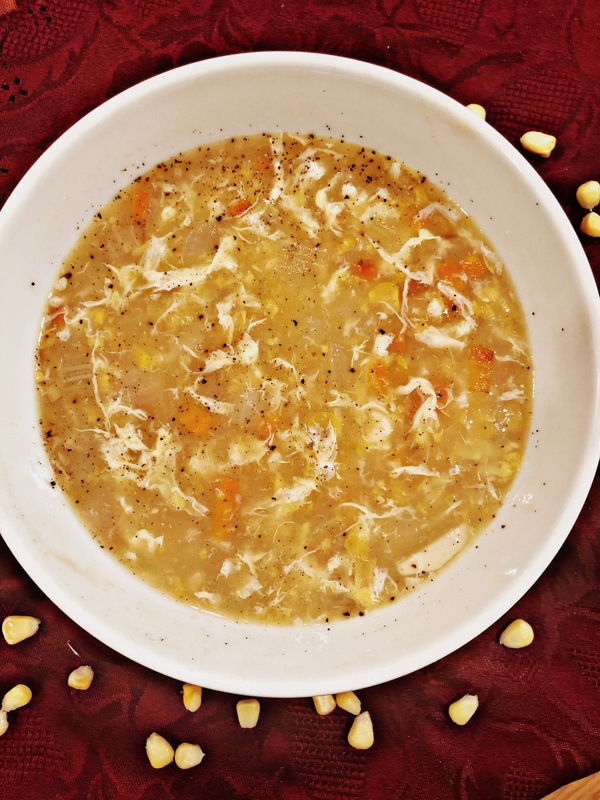 So here is simple recipe for sweet corn soup with egg drop using Instant pot. Switch on the Instant Pot in Saute mode. Now put the lid on for the Instant pot. Press the Soup button and set the time for 2 minutes. After 2 minutes, release the pressure from the Instant pot and open up the lid. Put the Instant pot back in Sauté mode. Mix the corn starch in cold water and add it to the soup. Beat the egg in a small bowl and slowly add it in the soup. Serve the soup with ground black pepper. Bong’s are usually purely non vegetarians. On a regular day they include vegetable curries in their diet, but for special occasion the vegetarian dish has to be spicy and rich in flavor. Dam Aloo, known as Aloo’r Dam in Bengali is a popular vegetarian dish that Bengalese enjoy with Luchi (deep fried bread made with flour) or Kachuri. This works as a starter for elaborate Bengali main course in special Bengali occasions like Weddings. On a holiday, for lunch, I can only make this starter part of the Bengali main course. But making the Luchi or Kachori will require more time commitment. So today we settled to have our lunch with Bong style Dam Aloo with readymade paratha. If you are wondering what to make for side dish for a Thanksgiving dinner, you can definitely consider this dish. Little spice would definitely spice up the dinner. Boil the potatoes in a pressure cooker or instant pot or microwave or in stove top. Do not put cold water on the the hot potato as it breaks up the potatoes. Crush the ginger and garlic in a blender and make a paste. Cut the tomatoes in small pieces. In a skillet heat one tablespoon of oil and fry the potatoes until it starts to turn light brown. Take the potatoes out of the skillet. Add cumin, and asfoetida in the oil. Add the ginger garlic paste in the oil. Let it fry for 30 sec. Add tomatoes in the oil and fry it for 3 min. Add cumin powder, turmeric powder, chili powder in the pan and saute until the oil separates out. Add little of bit water as necessary and based on the amount of gravy you want to keep. Add salt, sugar to taste. Add the potatoes and let it cook for 3 to 4 min. In a separate skillet, fry the rest of the cumin seeds, panch phoron and dried red chili until the cumin seeds turns dark brown. Crush the fried masala in a blender and add the powder on top of the dam aloo before removing the pan from the stove. Add little more dry masala for garnish.